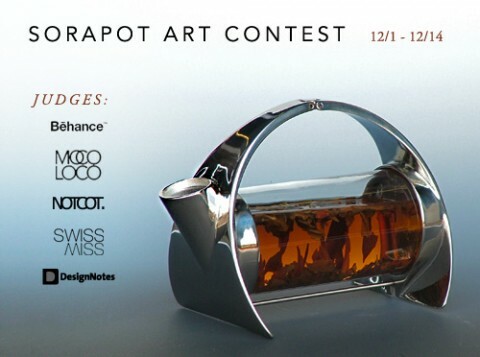 Joey Roth, creator of much beloved Sorapot started an art contest! I am happy to be one of the judges. Why don’t you enter? Looks pretty, but I don’t see a way to isolate the tea leaves after the recommended steep time. This is a MUST, especially with white and green teas. If not, the tea becomes bitter. I’ll stick with my bodum Assam. I have probably broken about 6 of them so far, but they function well. If there is a well designed , functionally appropriate teapot for an affordable price I’m all ears. I tried downloading the hi res image but it appeared to be in Quicktime and not tiff. Any way I could get the hi res tiff file? Thanks a bunch.